If one hundred monkeys can write a Shakespeare play, can one make a postseason football pick? Years ago, in my radio life, as a KVOR news radio cub reporter in Colorado Springs, I was privileged to meet the station NFL consultant. Ollie the Orangatan. A 2 year old ape at the Cheyenne Mountain Zoo. Ollie was young and immature. He pulled tantrums. He was impulsive. He once climbed me like I was a tree trunk and planted a loud, wet raspberry on my chest. But Ollie knew football. Once a week a zookeeper brought Ollie out of his enclosure. 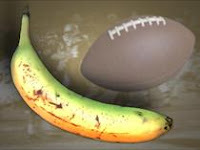 Sports reporter Jay Ritchie wrote the names of the Monday Night Football teams on two bananas and placed them within equal reach. And then Ollie made his banana-football pick. As I remember it, midseason, Ollie had a 60 percent accuracy rate. Not bad for somebody from Borneo. I don’t know what happened to Ollie.And if he’s still got the touch. And what he thinks of the Jets at New England. But I’ll always remember the raspberry. Which One Was the Vice President? Gimme a Break. I wrote it.